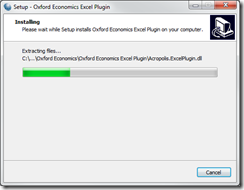 There is a new version of the Excel Plugin. 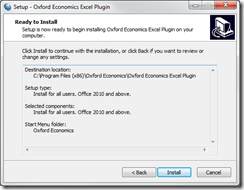 – Please go here for VERSION 3.0. Excel Data Workstation is one of three complementary platforms which make up the Oxford Economics Global Data Services. 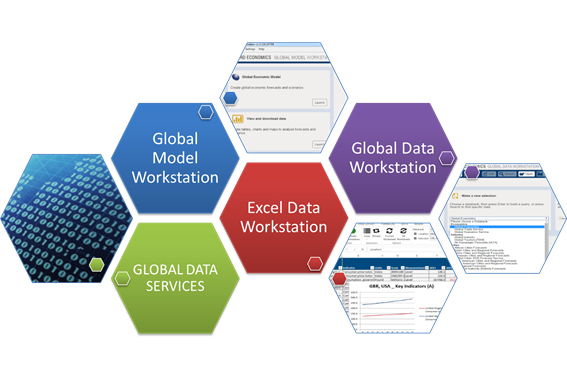 The other two platforms are Global Data Workstation and Global Model Workstation. Together they provide economic data and analysis functions covering 200 countries, 100 industries and over 3,000 cities and sub-regions. 1. 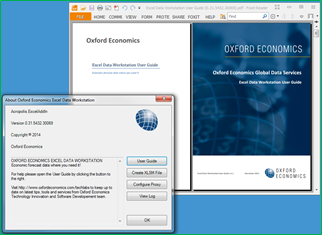 Global Data Workstation (GDW): Is an online web-based system currently serving 19 pre-packaged databanks covering several macro, industry, cities and labour economics domains. GDW provides a variety of data selection, heat map and chart visualisations, data downloads, data sharing and personalisation features. All databanks are updated periodically and the intention is to add more databanks over time. 2. 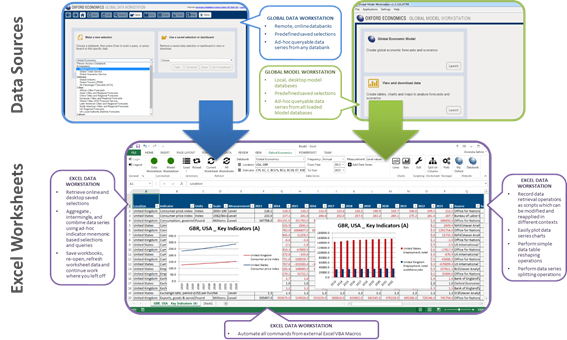 Global Model Workstation (GMW): This personal desktop application provides a variety of user driven economic forecasting, scenario modelling, and visualisation capabilities supported by periodic updates of the underlying macro and industry model bases. 3. 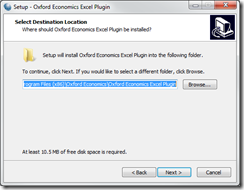 Excel Data Workstation (EDW): Is a simple but powerful Excel add-in which allows the user to connect to GDW and GMW, and bring data selectively into Excel worksheets. 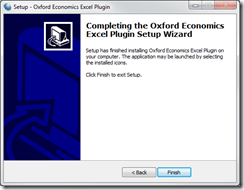 Data from these different systems can be intermingled in the same worksheets, saved and then refreshed easily at a later time when the origin source data is periodically updated. 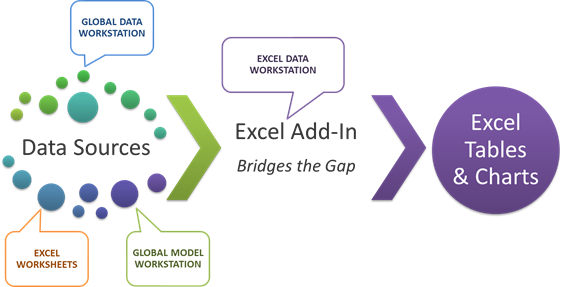 The pictures below show the big picture of how EDW fits into a data flow originating with data in GDW and GMW, and Excel worksheets themselves, finally ending with Excel tables and charts of your own custom analyses. Essentially, EDW bridges the gap between economic data sources and insightful results… right where you usually need it, in Excel. Follow the instructions below to download and install the latest version of Excel Data Workstation. 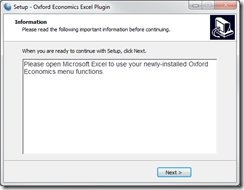 Once installed, an Oxford Economics menu item will appear in Microsoft Excel. Click on this menu to show a ribbon holding a number of functions as shown in the figure following. 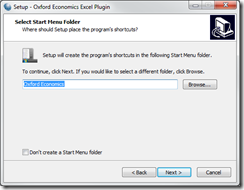 We recommend you mouse over the controls to read the fairly detailed tooltips provided. This is a good way to quickly get an idea of the features available. The ribbon is divided into logically related groups of functionality, e.g. General, Connection, Refresh, and Data Series. Each group has one or more controls used to perform actions, enter information, make selections, or indicate status information. 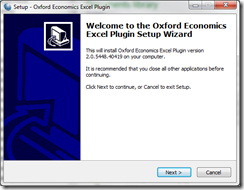 The user guide describes the function of each control in detail and shows examples of applying some of the more advanced features. 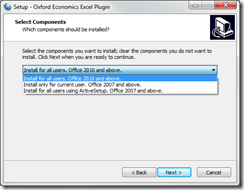 Right click the file and select properties. 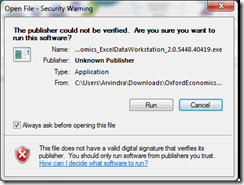 Click Unblock to authorise this downloaded file. Click OK. 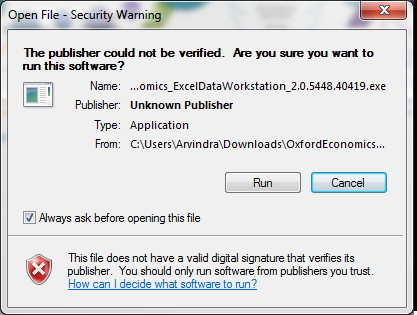 If you hadn’t unblocked the file you will get a security warning when you open it. It is safe to click Run. You’ll be warned that this program came from an unknown publisher. Click Yes. desktop IT environment. Contact your IT support if unsure which selection is appropriate. 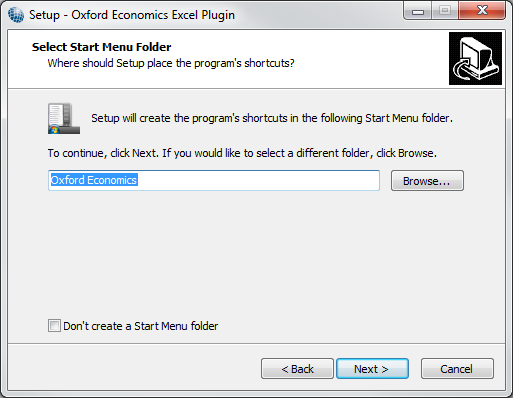 The user guide is available in Excel Data Workstation by clicking on General | Arrow to open the About box and then choosing User Guide to open the user guide PDF document in your default PDF reader application. The version number of the user guide distributed with EDW is consistent with the installed version of the add-in. 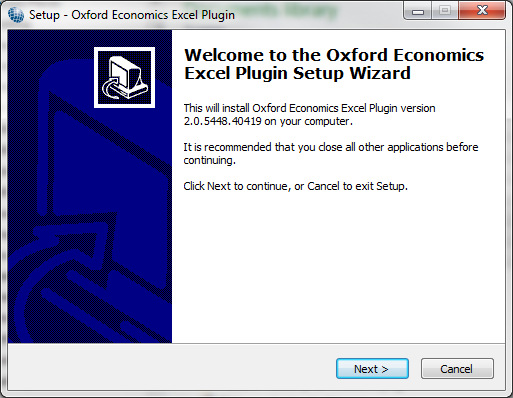 Click here to download the latest user guide without installing Excel Data Workstation.